Robert Laing is going up in the world. He’s just moved into a stark and imposing tower block on the edge of some nameless conurbation. By profession he’s a brain doctor tutoring students in cerebral anatomy. When not slicing and dicing the mind in the name of science, he’s settling into his opulent, identikit new quarters. Halfway up this gigantic, self-contained, radically innovative housing project. Why visit the ground? Laing can play squash on the gym level. Go swimming on another. Buy anything he needs at the hypermarket on yet another, his fellow shoppers averting their eyes, shunning any interaction. It’s a hermetically sealed microcosm of urban life, status literally dictating altitude of habitation. Previous adaptations of J.G. Ballard’s books include the emotive war epic Empire Of The Sun (1987), and the notoriously confrontational sexual subculture of Crash (1996). A treatment of his equally hard-hitting study of class and society High-Rise has been stalled in the pre-production stage since shortly after publication, a full forty years ago. Nic Roeg was the original name attached. But several false starts with various directors have all crumbled to rubble. Only now has the project come to full construction, via the design blueprint of a genuine maverick. Ben Wheatley’s singular vision brought us the hitmen-out-of-their-depth chiller Kill List (2011) and, most recently, the lysergic civil war horror A Field In England (2013). The potential offered by this Ballard fiction is just as disturbing as the fetishistic underground of Crash, just as shocking as the dark revelations of Wheatley’s black catalogue. Young, successful, prestigious and buff, Laing (Tom Hiddleston) attracts the attention of the peculiars populating the stories adjacent to his middling floor 25. Reece Shearsmith, the frazzled, hygiene-obsessed dentist. Sienna Miller, the flirty socialite intrigued by a potential plaything, Luke Evans her bit of rough from the no-go zone of the lower floors. Chief architect of this monstrous carbuncle, Jeremy Irons, lords over all from his vantage point on the top floor. Among such a dysfunctional array of humanity, only Hiddleston and Elizabeth Moss’ pregnant single mum exude any inherent decency at all. For now. Although it was written as a predictive satire of the near-future, Wheatley sets his realisation of Ballard’s coruscating novel in the period of its original inception: the smoke-thick, B.O. stained, fake leather, gaudily decorated world of seventies aspiration. Locked inside this ivory tower, an intoxicating whiff of emboldening yet isolating containment hangs in the air. From within the confines of this Kill Lift, glimpses of the city outskirts are hazy, the sky heavy with the apocalypse. The mood of malevolence is enhanced by another beautiful but oppressive score from Clint Mansell. Meanwhile the pop of the time is re-purposed to suit. A string quartet take on Abba’s ’S.O.S.’ soundtracks a surreal masquerade evening early on; a cracked, fragile version by Portishead crowning the collapse of order that is as sure as night following day. This is a vicious satire of the class system that, by design, works on multiple levels. Ballard clearly had the dream of sixties social housing turning to nightmare in his sights, the ideals and excesses of the free love generation turning sour. The sturdy foundations of Wheatley and screenwriter Amy Jump’s treatment support a widening of the targets: greed, selfishness, community, capitalism, control. As we slide deeper down the lift shaft of insanity, their vision is a kaleidoscope of degenerating indulgence, warped relationships and brutal exploitation. Extreme, hilarious, disorientating, occasionally gruesome, and with a subtle Clockwork Orange (1971) hue, High-Rise has the elevated air of the type of film that doesn’t get made any more. A retrospective period piece encapsulating the era in which it is set, yet bitingly relevant today. With the reinforcing scaffold of the law removed, the false airs and graces of ‘refined’ civility soon evaporate. Primitive behaviour lurks shockingly close below the thin facade of decency. None of us are really as sophisticated as we like to believe. 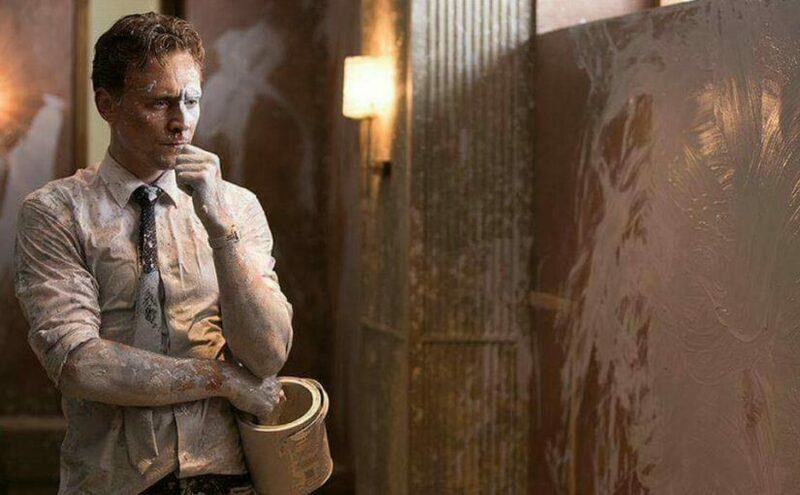 High-Rise is a chaotically radical, near-psychedelic demolition of urban acceptability from a visionary directorial mind currently residing somewhere on the outskirts of mainstream cinema. Ascendant.